With the recent announcement of the beta release of Hyper-V R2 (alongside Windows Server 2008 R2 beta), Microsoft are revealing a bevy of new and improved features to their virtualization offering. Since Virtual Server 2005 first competed with the other major virtualization products on the market, Microsoft have struggled to convince that their offering was a real option in an enterprise production environment. The feature and price war between Microsoft, VMware and various other Virtualization offerings wages on, even resulting in the reduction in pricing of the core virtualization offerings to £zero – whilst, of course, maintaining a meaty pricing structure on the more advanced features and management tools necessary in all but the lowest end implementations. 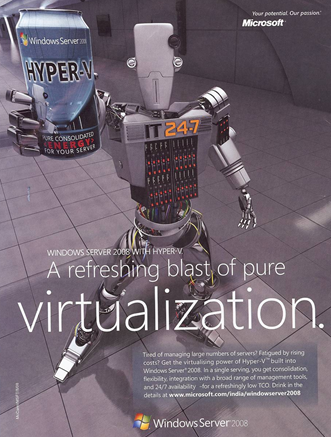 In the midst of all this and on the feature ‘front’, Microsoft released their new virtualization solution – Hyper-V. When released it seemed to tick all but the most advanced of technical boxes where the old Virtual Server 2005 solution didn’t. Only when compared with the top end features its biggest competitor did it fall short; for example, the lack of live migration which allows a virtual workload to be shifted from one physical server to another without network connections being dropped. So, in summary, Microsoft boosted themselves in the virtualization stakes by producing a more robust and enterprise grade virtualization technology with advanced management tools to boot – but still the offering was not the most feature rich offering on the market due to the lack of support for some top end features. Hyper-V R2 will add these missing features, including live migration, dynamic memory and with updates to other System Center products*, the Microsoft offering really does head right to the front of the queue for anyone looking to adopt a Virtualization product i.e. anyone looking to save money by reducing energy costs, physical server footprint, management time/load. *Data Protection Manager 2007 SP1 allows 15 minute snapshots of entire running Virtual Machines & Virtual Machine Manager (VMM) 2008 is an update to the very successful VMM2007 management product. Hyper-V R2 is currently available in beta and is slated for release to manufacturing as part of Windows Server 2008 R2 in 2010. For a list of expected features see here.